You could have almost every single significant passing record when you retire, but if you don’t win championships, your legacy will be diminished in the eyes of some. That’s what became of Dan Marino’s legacy having only appeared in one Super Bowl, but having most of the passing records when he retired. Now that time has passed and Brett Favre being the one who eclipsed a lot of Marino’s records when he finally retired, we all thought of Favre as the cream of the crop. Why? Because of the one Super Bowl ring that Favre has. Peyton Manning surpassed Favre as the leader in most passing categories in the last few seasons and in Super Bowl 50 won his second championship. 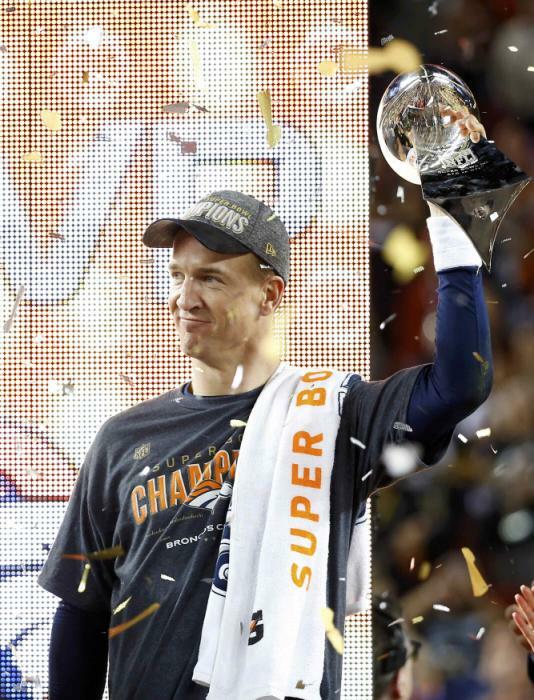 Those who like a storybook ending, hoped that Peyton would be the MVP of the last Super Bowl, but seeing him win regardless of personal accolades was perfectly fine. I’ve said many times that he is and probably will be the best quarterback I will ever see. You give him enough time to make the throw and he will nail it more times than not. If a defense would blitz him, he would already know what was coming and either audible or just let them come and still make the play to keep the chains moving. It’s an art that every team searches for in their franchise quarterback and there isn’t and probably won’t be another like him. Even if he never won a title, I would still put him in elite company of the all-time greats. How can you not with the amount of success he’s had throughout his entire career in the NFL? Like any great quarterback, he had to have great teams around him. Many of them failed to win a title, but having continued success in this day and age is a rare commodity. He was around for 18 seasons and one of those seasons he was sidelined the entire year. This last one was statistically his worst since his rookie year. However, he still managed to bounce back and get his team into the playoffs with home field advantage. His defense took care of the rest in the Super Bowl, but without Peyton I don’t think the Broncos would be celebrating another Super Bowl victory. It was an amazing career that could have ended sooner, but he persevered and found a new home to continue his quest for one more ring. Generations of quarterbacks have a gold standard to look up to now. Peyton had many to choose from, but you could argue that there is only one standard from now on. This entry was posted in Football and tagged Broncos, Colts, Football, NFL, Peyton Manning.